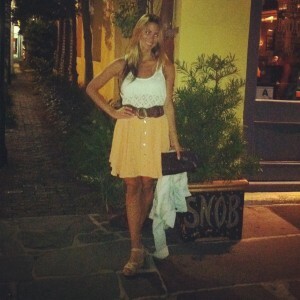 For my Southern Summer Nights outfit I chose this sweet lace tank paired with this peach skirt. I kept the accessories simple wearing my favorite everyday necklace and of course a belt! Have you noticed I belt everything? I found a cute lace bandeau to go under the tank. Last but not least, I thought that a pair of feminine wedges was the right way to go for this summer evening out on the town. Do you like these looks? I'd love to see your idea of a Southern Summer Nights look, please send pictures my way and I'll feature some of them in a another post soon! Well, you always seem to dress the part to a “T” Tenley! And look great doing it! We LOVE Charleston so much and have also spent vacations in Isle of Palms, SC, which we highly recommend for a romantic, beach get-away. We live in So Cal but visit that neck of the woods often because of close relatives in North Carolina. Did you guys get to walk along Battery Park and see all of the gorgeous, waterfront, antebellum homes? I think that is part of what makes Charleston so special, the one-of-a-kind, historic mansions and they come in so many magnificent pastel colors! We also enjoy S.N.O.B. and shopping all the boutiques oozing with Southern charm and hospitality…ahhh..you made me miss it there!! Think I’ll make myself a (stevia) Sweet Tea and reminisce … and then try to find those wedges, too cute! “ShellK” Thank you so much for your comment. I absolutely loved Charleston like you do it sounds. We didn’t have very much time to explore this trip, but we did see the gorgeous homes, the beach (Sullivan Island), and some of the main tourist spots. I’m glad you were able to reminisce through my post! Enjoy that sweet tea. And thank you for the heads up that my links weren’t working, they’re fixed now!! P.S. some of your links on this post go to “error 404″…for me anyway 🙁 ?